Here in South Africa, a number of breeders experienced a terrible breeding season, which we attribute to an upside down set of weather patterns during 2015. Of 5 pairs of Corns that I paired up, only 2 pairs did the deed and only 1 female became gravid. The successfull pairing was Male Sunglow x Female Amel. The intention being to produce some high end Amel babies. By the way, I do not know of any hets carried by the pair. Around the middle of December, the female laid 15 awesome eggs. Uhh sorry to hear that it wasn't like you planned. But congrats on that successfull clutch! Hope they will be all healthy! Pardon the intrusion, but I have a question regarding breeding. Is it always necessary to incubate the eggs away from the mom or is it just to avoid cannibalism? That is just one thing I found the mom might do. There are many threads on maternal incubation and the snake certainly has the ability to do it. I think most breeders don't use it because it is easier to control conditions in an artificial incubator so you get a higher percentage of healthy babies. I have not heard of Mother/Egg cannibilism. In the case of Corn Snakes, the mother would not stay with the eggs, she would lay her eggs in the wild, perhaps recoup her energy for a day or so, and then leave. In captive conditions it is easier to have a controlled environment when incubating the eggs, this just serves to have a better chance of a maximum hatch rate. This is just my opinion. Others may have different thoughts on the matter. Ah ok then. Thank you and good luck. Well, my terrible Breeding Season continues. There was a malfunction on the Probe / Thermostat in the Incubator. Found the temp. at 50 Centigrade. All 15 eggs lost. Sometimes I just wonder if it is all worth it, and just want to give up and get out of the Hobby. I'm so sorry that this happened to you Frisky. One thing I would like to mention (and I hope that it does not add insult to injury) is that it is best to minimize the heat source within an incubator in such a way that it would not exceed a "safe" temperature if uncontrolled...kind of a built in fail safe if you will, that way if your thermostat does fail, this won't happen for you again. With a lot of commercial incubators this is very hard to achieve as most just get too hot. DIY incubators are the way to go because of this. Just some things to consider in the future. Don't let things like this discourage you, I know it's hard, but these things can happen to anyone from time to time. Keep your chin up. 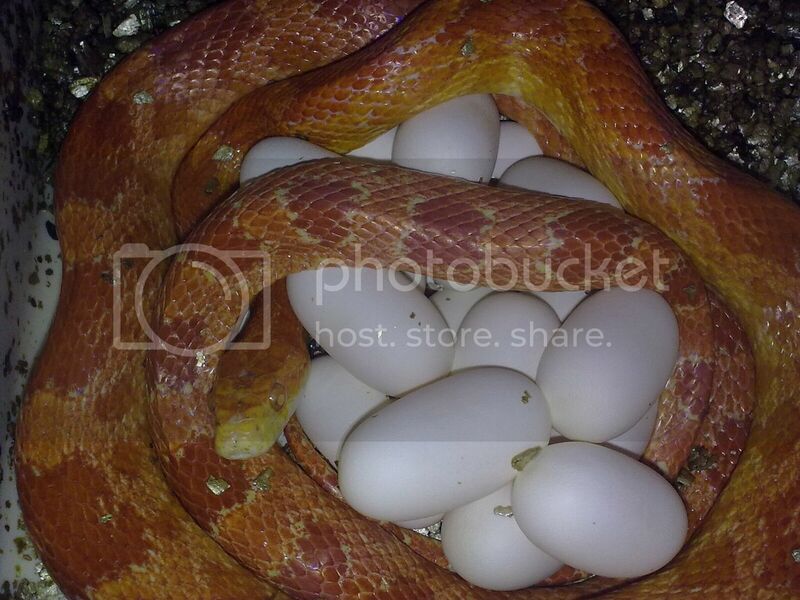 Heres' the thing though, I have been breeding Corn Snakes for around 15 years. In South Africa, and the Province I live in, our average daily Summer Temps. are around 30 Celsius. It is the middle of Summer now. In all my years of breeding Colubrids. Corns, Kings and House Snakes, this is the very first time ever that I have used an incubator. I normally just put the eggs in a tub on some vermiculite on a shelf in the snake room, and normally between 55 and 70 days, I have hatchlings. This year I thought I was clever and got an incubator. Turned out to be a not so clever idea. Nevertheless, said incubator has now been sold to someone else. Moral of the story - "If it ain't broken, don't try to fix it". Well the good thing is there is always another season. Keep breeding and hope you have better results this coming season. Thanks Albert. I definitely will try again.